I’ve been to Chicago countless times, and the city holds a truly special place in my heart. I love the city, the people, the vibe, the food, the bars, and any chance I get to visit, I make an excuse. But a trip during the Summer to Chicago? Well, the bear has come out of hibernation, the caterpillar turned into a butterfly, lets just say this city changes from Andy Dwyer to Star Lord. The city spills into the streets, beaches, rooftops, rivers, and is a ton of fun. 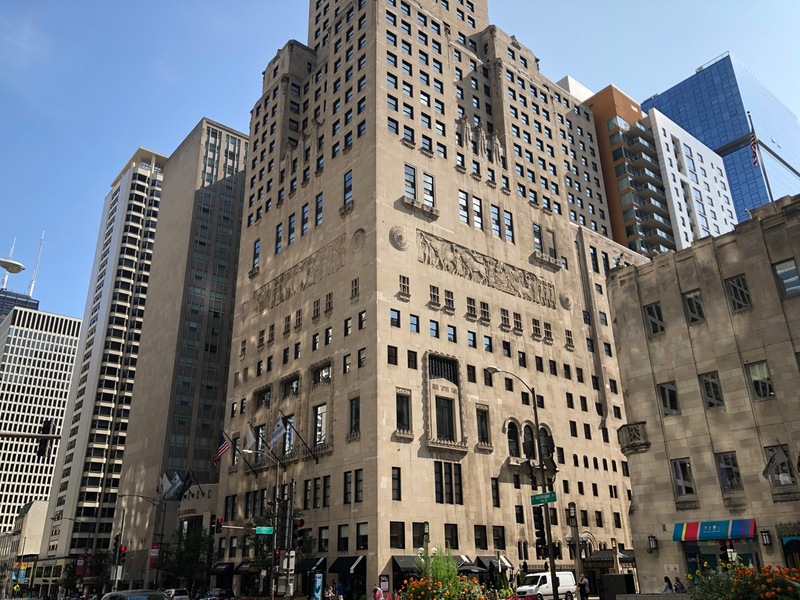 I’d stayed at the Intercontinental roughly 10 years ago during a New Years trip and found the hotel to be quite tired, but it completed a $13M renovation in 2015. The hotel often advertises outstanding sub $150 rates, and this presented a great opportunity to check it out again. Last July, my cousin was celebrating a special birthday and my family planned a surprise trip for her. Since both of my parents are Intercontinental Ambassadors we thought it presented a great opportunity to book BOGO award nights that are an annual perk of Ambassador membership. One great perk of the Ambassador BOGO is that it often applies to rooms above entry level. This was the case at the Intercontinental Chicago. We were able to use two certificates, the first on standard King, the other on a One Bedroom Suite. We thought this would afford us a little real estate for everyone to hang out while still getting two free nights. It also extracted additional value from the BOGO. The hotel is well located just north of the River on the corner of Michigan Avenue and Illinois. You’re within walking distance of Navy Pier (20 mins ), River cruises (5 mins ), shopping on Mag Mile, Water Tower/Hancock (10-15), and the Willis Tower ( 15mins). If you’re considering driving into the city I’d HIGHLY recommend using SpotHero to find cheap parking. The hotel rates are NOSEBLEED and you can find parking for $15-20 a day within a few blocks of the entrance. The Intercontinental Chicago has a grand 2 story lobby featuring a gorgeous floral arrangement. Continue on and you’ll find guest check-in. There are two towers in the hotel. The last time I stayed in the hotel I was in the north side of the building, the historic side, or what they call the Grand Tower. Not my favorite. Perhaps post reno these have been updated, but having stayed in the Executive Tower, on the south side, it’s incomparable. The south tower has very few rooms on each floor making it a far more intimate stay. You’d never guess the hotel has hundreds of rooms. The south tower even has its own entrance which will lead you past Michael Jordan’s Steakhouse before getting to your elevator bank. The Suite we booked was a standard one bedroom executive tower suite. It’s advertised as roughly 500-600 sq feet. I’d have guess it was on the larger side of this range with all corner vantage points. For the roughly $250 a night we were paying ( and the 2nd was free ) it was a great deal. A few feet down the hall, on another corner was the king room we booked. It was very large for a city hotel, and had we not needed the extra sitting room, I’m not sure booking a suite was really worth it. Although prorating the BOGO, it wasn’t much more per night for the extra space which is great if you and your partner don’t share similar sleeping patterns. The most special aspect of the hotel is its incredible junior Olympic size pool. There’s even tiered seating, and the entire design speaks to some of the Moorish elements you’ll see throughout the hotel. It’s quite the sight to behold and one of the coolest city hotel perks I’ve ever seen. The best part of this hotel is the fact that Starbuck’s is a part of the building. Look, I’m addicted and biased, but being able to go directly through the lobby into my favorite coffee shop and get some of that good, good is amazing. There is also Michael Jordan’s Steakhouse, Eno, and Center Court. I would stay here agin in a heartbeat, and I’ve stayed at my fair share of Chicago properties. The renovations make this a competitive hotel in the price range, and the location is great. I wouldn’t hesitate to recommend the property; however, I think the pricing usually lends itself to paying outright rather than using points. At the time of publishing the Intercontinental Chicago Magnificent Mile costs 50k IHG points per night. Using 1/2 cent per point valuation, I’d say its worth using points when you paid rates are above $250 a night. If you hit this property at the right time, like dead middle of winter, you’ll get rooms circling $100. That is a downright steal especially if you can compound your stay with an Accelerate promotion, or whatever IHG is calling their latest promos these days.